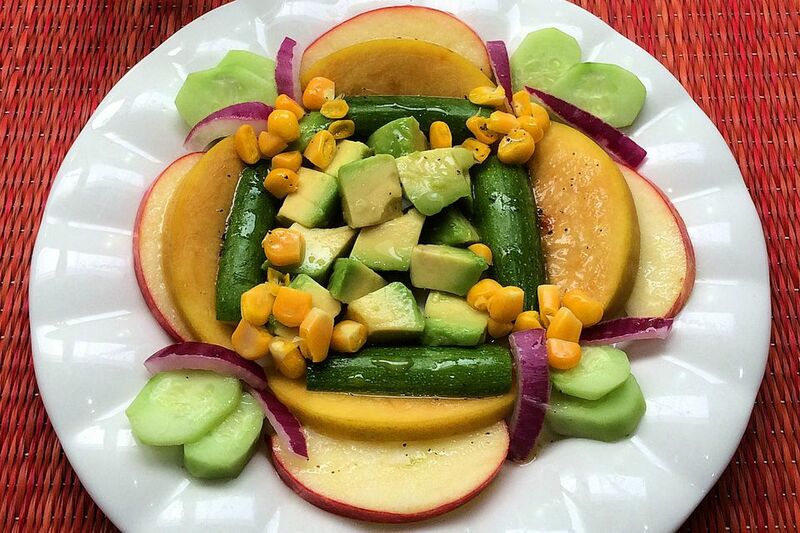 Corpus Christi Salad is a celebratory combination of those fruits and vegetables that come into season in Central Mexico’s spring and early summer. What follows is a basic recipe, but don’t hesitate to modify it to take full advantage of the items that are season where you live. Be sure that all the ingredients are fresh, however—skip the canned and frozen stuff when making this delicious and decorative salad! Did you know? The feast of Corpus Christi is a Roman Catholic solemnity that has been celebrated in Mexico since 1526. It has no set date, as it is dependent on the date of Easter (a moveable feast), but always falls on a Thursday in late May or early- to mid-June. It is a day of religious processions through the streets, and since it comes at the time of the first spring harvests, it was traditionally an important occasion for farmers to bring their fruits and vegetables to sell in the plaza surrounding the local church. The name of this salad evokes this Mexican tradition. Note: while there are multiple steps to this recipe, this salad is broken down into workable categories to help you better plan for preparation. Cut the kernels of corn off the cob with a sharp knife. If the kernels are crisp and very tender, use them raw. If not, boil them for just a few minutes, until barely soft; avoid overcooking. The squash can definitely be used raw. Cut it, unpeeled, into rounds or sticks. Peel the cucumber and slice or cut it into smallish chunks. You can peel the apple and peach, if you like, but leaving the skin on can add attractive color to your salad. Cut the fruit into small chunks or slices of no more than 1/2-inch thick. Place the chunks or slices into a bowl and add the lime juice; toss so that all the surfaces of the fruit are bathed in juice. Use tongs or a slotted spoon to remove the fruit, leaving the excess lime juice in the bottom of the bowl. Thinly slice the onions. Cut each slice into about four parts. Place the cut onion into a strainer and rinse briefly under the faucet. Drain well and pat dry with a paper towel. Arrange all the prepared fruits and veggies in an attractive pattern on one large platter or on individual salad plates. Take your time and have fun with this step; the beautiful shapes and colors of the ingredients will help you to create a salad that is as much a delight to the eyes as it is to the taste buds. Combine the olive oil, vinegar, salt, pepper and any remaining lime juice in a jar or other container that has a tight-fitting lid. Put the lid on, and shake vigorously until the dressing has mixed well. Pour a little of the dressing over each portion of salad at serving time. In addition to or instead of the fruits and vegetables mentioned in the basic recipe, try to take advantage of any produce that is in season in your region. Try Corpus salad with slices of pear, halved grapes, small, tender peas (raw or barely cooked), wild berries, etc. Serve your delicious Corpus Christi Salad on lettuce leaves or a bed of finely chopped lettuce. If your Corpus Christi Salad is to be served at a location that makes artistic presentation too difficult (such as at a picnic, get-together at someone else’s house, etc. ), place all the ingredients except the dressing together in a large bowl. Stir, adding the dressing, right before serving.